Tickets: $15 advance, $20 dollars at the door- phone 763-732-2992 to book a ticket -Sorry, but this is a men-only event! Ribfest: Blues, BBQ and cool people! 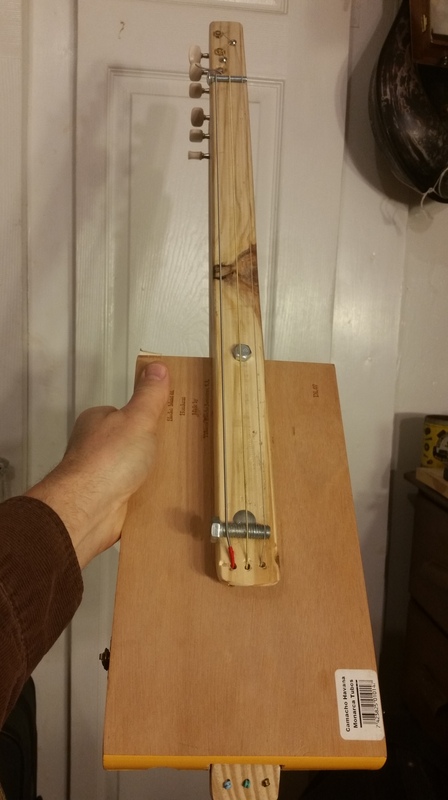 From their Facebook post: Learn how to build your own Cigar Box Guitar with Glenn Kaiser! Free workshop @ the Warehouse Church Project Shop. Saturday May 26, 8-11am. Just a block from Aurora Downtown! You may purchase a kit with building supplies for $15 at the event. Supplies are limited! Email office@warehousechurch.org or call 630.859.0600 to reserve a kit. Hear a mini-concert and brief history of the blues by Glenn at the 9:30am Coffee Break. Last year this was awesome, if you’re within driving distance – don’t miss it! Well, flyin’ or just travellin’ light! Been thinking about trying a build like this for a while. Always have several ideas cookin’ and today after cleaning our grease trap (yes SIR) I decided to have a bit of fun and give this one a go. It’s a whooped-up idea, a quick rather than pristine build (mine for me are always that) and truly a prototype w. all sorts of mistakes and dings (like GK) but she sounds nice and if she’ll hold up I’ll add a few position markers (black screws on the side of the neck). She sports a pickup and 1/4 input jack so can be amped up too. There are various ways of creating a folding neck cigarbox travel/backpacker guitar, but when it’s a slide it really becomes simple because of course the strings aren’t ever pressed down the neck, you don’t need frets. Plus if you only use 3, 2 or 1 string the tension isn’t a worry re. using a small door bolt. Note the bolt simply lays down even if it’s loose so she won’t open up when playing no matter what. Loosen the strings, slide the bolt, toss it along with eyebolt “bridge”, slide/s and pick/s and a little tuner in a laptop bag or backpack and you gotcha a light, fun travel git! To play, just open it, slide the eyebolt in place under the strings, slide the door bolt shut on the back of the neck, tune stings, stretch and tune strings until they’re holding the notes and you’re ready to play. That’s what I’ve affectionately named my latest crazy creation which you see here. I’ve built cigarbox doubleneck slide guitars before but not like this ‘un. She needs several bits of work to totally finish including small black screw position markers and, etc., but I was exited enough about it to just post as is for now. 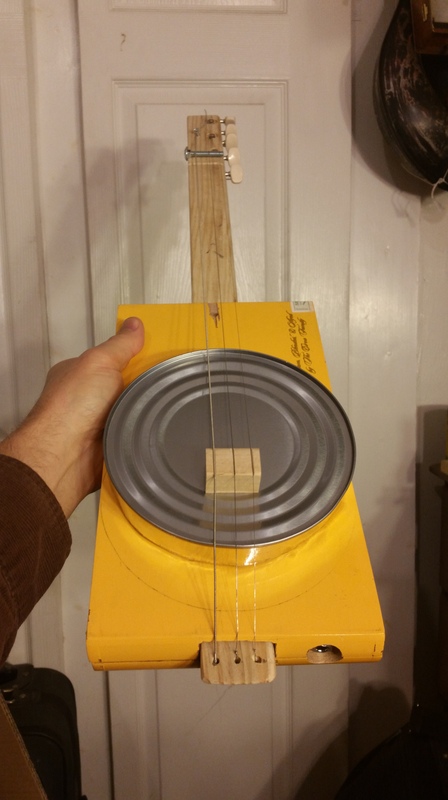 I usually refer to such items a prototype, not that I’ll ever build another like it, but the proof of concept, imagination and then completed idea for a cigarbox, cookie tin or otherwise found-object slide guitar is a therapy and joy for me. Then when I pull ’em out in a live blues gig there is that guilty pleasure of “Yes! It’s ALIVE!” and the deeper issues are stirring personal inspiration as well as a tactile object lesson- sometimes taking some degree of risk in order to live a creative lifestyle on the cheap. You learn as you go and so do those who might share a similar interest. I am forever coming up with fresh ideas either totally in my own head or from seeing and usually expanding or deriving something different yet again from someone else’s work. All fun when building/playing these little slide guitars. As each year takes me all over the map on tour I am continually considering fresh travel guitar concepts… so here we have a two-in-one close to complete, a few tweaks and cosmetic things yet to finish. And perhaps a few more decisions, like doing this as a bridge (bolted in place, slight string slots added if I do). For neck wood I just used what I had lying about. For me slide guitar playing means the neck can be baseball bat thick and not be an issue of comfort. If either neck were fretted (and hence needing to press the strings down onto the neck) it wouldn’t have worked to place them like I did here as I’ve rather small hands. What I wanted was a cool but rather thin box, more rectangular than square, two necks with 3 strings each. 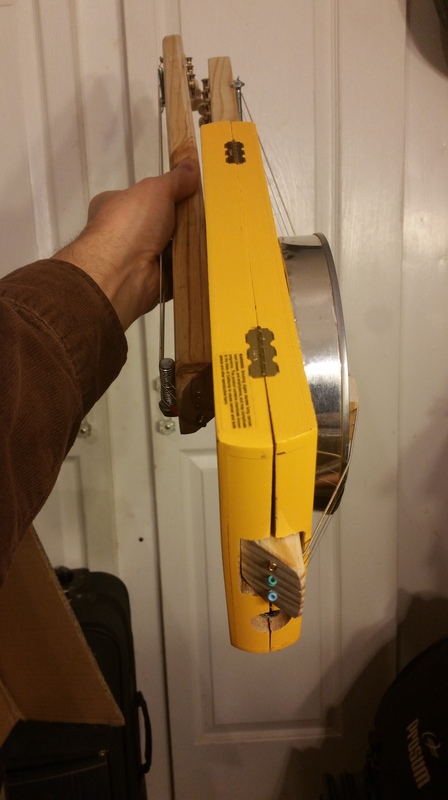 I decided prior to use a bass string and two wound guitar strings on the one neck affixed straight onto the box, bolted in place with a little rise where the strings would run through so all tension would be on the neck ala Uncle Crow’s design (search for him at http://www.cigarboxnation.com) and a flat, round piezo pickup placed between underside of neck and back of the box. 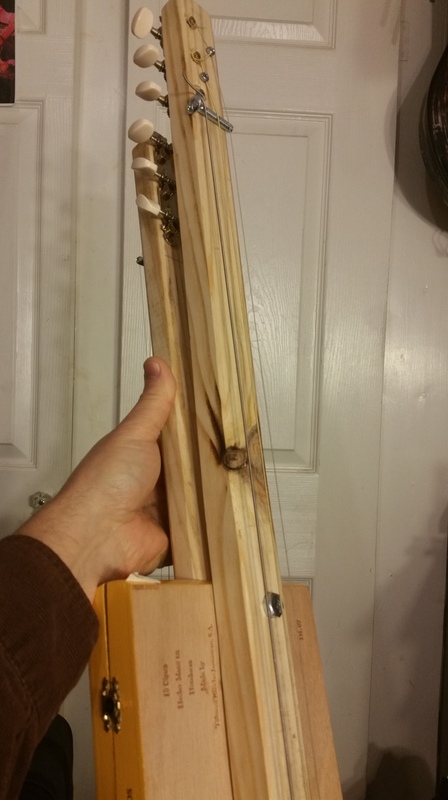 I decided beforehand the other neck would be flush and tight running through the body inside and just protruding enough to load strings outside the bottom of the box. 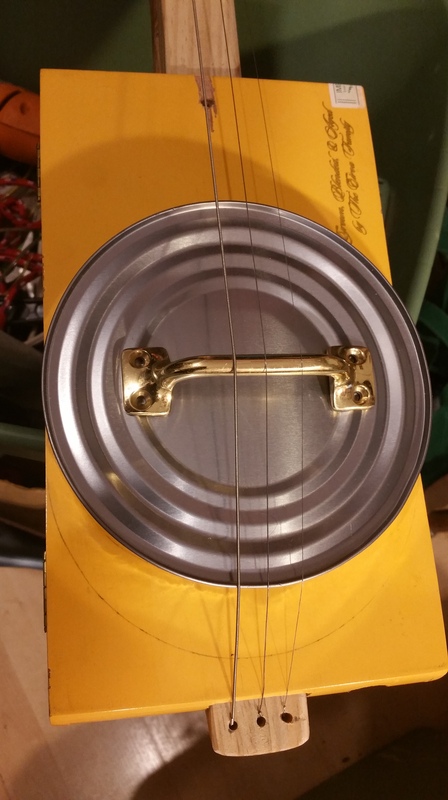 Then mounting that one first along with the bottom section of a 10 inch industrial sauce can right on top, another piezo disc hot glued to the underside of the can and 1 wound, 2 plain guitar strings running atop that would give me a dobro or perhaps banjo-like sound. Each neck would be tuned to a different pitch providing not only two different root chords but truly different sounds one guitar. Further, I planned to wire both pickups directly to the 1/4 inch input jack and just listen to whatever happened! When switching necks you just flip it over, she’s light enough to simply use a tough 3 strand string placed around the “dobro” neck between the strings and body and when properly tied in place just flips. My belly sufficiently (!) deadens the strings regardless which way I’m playing it and I do think the fact both pickups are live all the time adds to the tones both ways. I had a mess of strings out of packages so am not fully certain of the actual string gauges so sorry to say I cannot list those, but hopefully can add a video clip somewhere so you can hear both sides of the git. She measures 30 inches tip-to-tip, just under 4 inches thick at the thickest part strings-to-strings. The dobro scale -nut to bridge, is 16 3/4 inches and the lowboy scale is 19 1/4 inches. I’m blessed to report both sides of this one git offer two very different but both cool acoustic as well as electric sounds, two 3 string sliders in one accomplished. SO fun to string both up and hear my two-headed-monster sing and indeed growl quite nicely! Perhaps yellow is the new blue s ?? Apostle Paul writes “Love is patient… love is kind”. He goes on to say it isn’t arrogant, not self-seeking. Ouch. A good pastor friend of mine asked me about someone who might teach a group of leaders at a larger gathering on the subject of humility. I immediately said “Not me, that’s for sure” and mentioned a solid friend whom we both respect who I thought could do an admirable job. Tonight the thought came to me after years of considering love, humility and patience, and it’s a fresh thought that just might hold water: the truly humble are typically extremely patient. They’re not wimps, automatic pushovers, freaked out at bullies or mean, “let-me-demonstrate my power” types, they’re just so thoughtful, patient and non-arrogant that they overcome, they endure through the flack that comes their way. Another point in that 1 Corinthians 13 text via Paul: love “endures all things”. Some reading this are of a minority race, ethnicity, subculture or perhaps thinking “Right Glenn, you’re a white man in a position of respect so are you calling beaten-down people who are discriminated against, sometimes shot and killed for being black, herded onto reservations for being red, judged as rubbish simply for being brown, Latina/Latino, Arabic, Asian or poor, or etc., etc. -to be patient about justice and equity?! No. If you track my life, words, lyrics and actions I think you’ll find I’m an advocate for you throughout my lifetime. It’s ME who has had to learn patience with my fellow white privileged citizens. Solomon tells us “There is a time for every purpose under heaven” and goes on to say things plenty of us would rather not hear and likely would disagree with UNLESS we get our way out of the situation and issue. Reality, that. Yet there is this core thing, that in human relationships for the professing follower of Jesus, patience is both a command of God, a fruit of God the Holy Spirit and in fact a revelation of God’s very nature! He calls us as sons and daughters, as brothers and sisters or certainly those who may possibly become (spiritually in Christ) brothers and sisters in the faith, to emulate HIM and the character traits of our common Father: Love, patience, kindness. For many of us all too often our lack of patience, love and grace toward those with whom we disagree with triggers a… trigger. A blast. An attitude that does not correspond to any of the nine fruits of the Spirit in Galatians chapter five. Somewhere between a default to either fight or flee comes the very patience of God, or it does not and hence we destroy rather than create for those most in need. The context is that more people would reach a genuine saving relationship with Jesus before He returns and this world is “folded up like a scroll”. All the power trips, all the arrogance will melt in His presence. The “powers that be” will amount to spit in the oceans when we stand (kneel… lie flat?) before the Lord of Lords in that moment. Every knee shall bow. Every. So what of patience in you and I dear reader? Indeed, we each have work to do and it begins with His work in us. Well, gigS because I helped ’em w. a cigarbox guitar building extravaganza, did a couple preview sets prior to Sat. night full show, and also helped get a slingshot building/indoor shooting contest going this year. The Ev. Cov. Church hosts this packed-out weekend annually, and this is I think my 2nd appearance at the Expo. Super cool family event with booths and seminars on a lot of outdoor activities re. fishing, hunting, bird-watching and the like. They have seminars on raptors, game calling, this year had magnificent trained birds flying around the main high-roof sanctuary and to roost! The thought struck me I could also build a cigarbox guitar on site and finish it prior to Friday’s late afternoon opening. They always have me play a song or two on Fri. and Sat. to give people a taste of what the Sat. evening set will be like. I brought an extra pickup, built a git right there so they could auction it off and use that money for some needy folks. It’s the pretty black one in the last photo below. I’ve included a couple shots of the cb git building workshop (packed out, a LOT of guitars were build) and sorry but I forgot to shoot pics of the slingshot building and shooting competition but it was also wall-to-wall. Here’s one of the slingshot builds. Super fun! If you get larger, strong rubber bands and double them up, and in our case using solid hardwood balls, they rocked those empty plastic bottles and targets nicely! And yes, adult-supervised, all shooters wore protective glasses. So you get a slight sense of how well this event is attended each year in the other pic, and then you see all my arsenal for the Sat. night gig except for the sweet Taylor acoustic guitar and Fender Blues Jr. hotrodded amp the kind tech/guitarist provided for me to use. I included a pencil for banging on the diddley bow (1 stringer), Altoids tin git w. pickup, the guitar I built for auction which I played, the smaller copper slide they provided, my 2-way (ring finger or lap-steel approach) copper slide, my wife’s cool embroidered strap I use, a Huang C harmonica, neck brace, my little Shaker harp mic, and one of my fave scents via my sweet Wend, that being Hearts and Daggers. Oh, and a plastic pic I made as well as 1/6 of an old credit card which is my main guitar pick. All important tools 🙂 of the trade! Toward the end of May I get to do the third Cigarbox Guitar workshop I’ve done at Warehouse Church in Aurora, IL, w. a short history/playing lesson. We will post details on that very soon. I’ve also accepted for the second year in a row, a weeklong cbg building workshop where I will also bring a music set at Idyllwild Arts in California this June. Again, details will be posted soon. April 21, 2018 – 44th Anniversary Celebration Come celebrate our 44th Anniversary. Special guests Rex Carroll and Glenn Kaiser @ 7pm! As I type it’s a quiet Sunday afternoon, 35f feeling like 34 at Chicago’s lakefront and wind at just 1mph with a bright sun -or it’d be quite cold here! Of course snow is in the forecast tonight as well as tomorrow and friends in western Illinois and elsewhere in the nation have been amazed at late snowstorms or snow at all at this point in April. Not me. I’ve lived long enough to see most everything. For those still living out a cold winter, for those metaphorically who will yet be experiencing it even in August (even in the northern hemisphere) due to any number of difficulties, pains of any and all sorts: seasons never last. Change will come, it always has, always will and will when this very world is “rolled up like a scroll” to use New Testament speak. Spring is coming. Four seasons, not one. Transitions between them. Overlapping elements. Admittedly, this it not merely a matter of faith but life-experience. If we weren’t alive we wouldn’t feel any of it but neither would we experience genuine love. Sometimes it may feel like (and truly be) you’re stuck in winter. Or the mud of spring, the heat of summer, the colder rainy/ice-stormy/wintry mix of autumn. There are and shall be moments you think “Spring ain’t NEVER comin’!!!”. I took a slow walk around our mostly not-super-obviously-living side yard garden today. In a fairly brief sweep I noticed five and more clumps of buds, bits of color here and there, and that without really searching much. Poor little flowers and plants don’t read WeatherUnderground and maybe don’t know what may be hitting ’em in the next 48 hours. And yet as long as this world spins and for eternity after, my faith and the One fueling it make it clear right through His Word and my own experience and that of millions of other Christ-followers: Spring Is Coming. She like many had begun to recognize my addictions, my self-focused mess and how Jesus had begun healing and changing me. I was surprised but really encouraged to see that verse for just as there’s no endless night there is no endless season of misery either. Today I took my hot coffee, buttoned the sleeves and to the neck my corduroy shirt but I still wore shorts and sock-less Crocs around the garden path in the sun this afternoon. With and by God and His grace I also wore a smile!